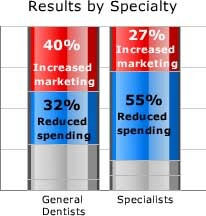 In this survey, we found that almost 40% of dentists have increased marketing due to today’s dismal economic climate. When we asked if their dental practices had yet taken any actions as a result of the current economy, 38% reported they had increased dental marketing, while 33% said they had cut spending and were tightening their belts. Only 8% said they weren’t doing anything, and 21% said they hadn’t done anything yet but were considering it. Silver lining for dentists in stressful times? What can you do but increase dental practice marketing? Note: Survey sample included 105 respondents.